Some people who made art environments are only known and remembered because of old picture postcards which portray them and their place of living. The picture above is such an old postcard. It dates back from around 1910 and shows a house named Palais Artistique, which in former times existed in Rogny-les-sept-écluses, a small village of about 700 inhabitants in the centre of France. 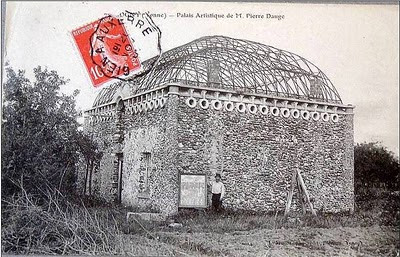 The house was constructed by someone named Pierre Dange. The postcard above ¹ has the name Dauge, but this probably is a mistake. 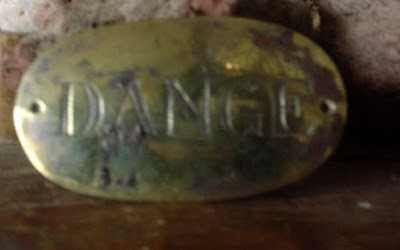 French weblog Vasavoir-Afga (which focusses upon the community of Rogny) has a picture of the nameplate at the entrance of the demolished house, which reads Dange. The story is that Dange constructed this house with his own hands, giving it a special appearance with its strange roof and the sturdy walls with just a few windows. The top of these walls have elements that in french are called meurtrières, small openings in a wall to observe enemy forces and shoot at them. For Pierre Dange they had the function to defend the house "in case the Prussians would return ". Apart from other things, this could mean that anyhow the house was constructed after 1870, the year of the French-Prussian war. The house was located in the higher parts of the rue Hugues Cosnier, a street that still is extant in Rogny. Here is another postcard with Dange posing as a painter. The portrait represents someone (a king, a queen?) with a crown. Not much is known about Pierre Dange's activities as a painter. In his weblog (nov 15, 2011) Bruno Montpied has presented a picture of a painting that may have been made by Dange. It suggests he worked in a naive style. As said, the house is no longer extant. And probably most of the current residents of Rogny have no memories about Pierre Dange either, maybe with the exception of an octogenarian lady who told Jean-Michel Chesné that she, at the age of around seven, visited him. At that time, around 1930, Pierre Dange already was a very old, not so friendly man, who lived in a distressed condition. As far as the lady remembers, there were no paintings around in the house. ¹ this postcard was forwarded to me in February 2011 by Bastiaan van der Velde, thanks a lot! Memories fade, legacy do so as well, Pierre vanished without leaving a trace? No! We people who share ages and times, share also another thing, we are accomplice with people from past and future, who give us each other the tafet again and again. Pierred may not live in books and encyclopedias, but come to life in this blog, come to life through the existence of the land in where he lived. It doesn´t matter if no body ever mention him again, we did, we met him trespassing the frontiers of centuries, we received the tafet from him, his legacy (forget about qualify or quantify it) came to life again. Thanks for this comment...you have a wonderful way of looking at people who lived in the past and who can come alive by the attention we pay them through our thoughts and interest...I like this approach very much. Hi Owen, I also wonder what has happened...probably we will never know. The construction of the seven locks (nowadays without water) can still be seen in Rogny. Merite un détour! Thanks for this message. 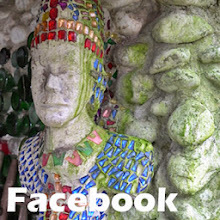 And welcome to my FB page on outsider art environments in Europe as the 550th follower.